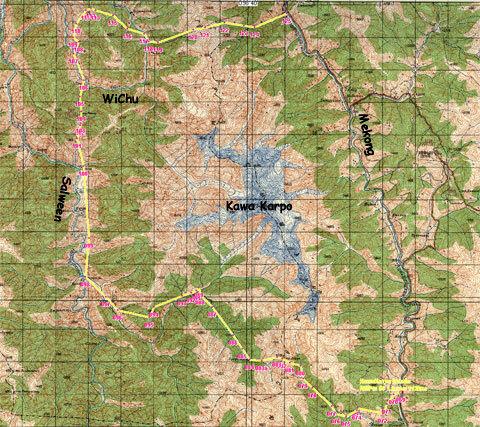 Map of the big Kora around Kawa Karpo range. Starting point is the village Yangtsa at the Mekong south of Deqen. End point is the village Meilixi at the Mekong north of Deqen. The route leads from the Mekong to the river Salween and then leads back to the Mekong via the river system of the WiChu. The Kora around Kawa Karpo is a strenuous trek of about 250 kilometers in length leading across six high passes with altitudes above 3000 meters. In large parts, the trek follows olde trade routes for tea between ancient China and Tibet.